I Don’t Test My Code Until But When I do Its In Production. There is always that one guy that lets his code slip right on by or makes changes that are part of the scope and ends up screwing the on call developer for that day. Which I found this developer meme to be absolutely fitting because we have all worked with those kind of people and have hated them dearly ever since. 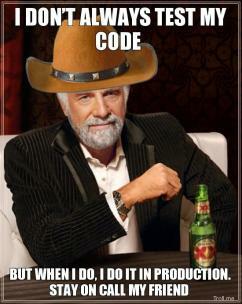 I Don’t Always Test My Code But When I Do I Do It In Production Stay On Call My Friend. Developer meme.